St Peter’s stands in a lovely setting, in a field surrounded by a picturesque and much loved churchyard; in Spring there is a succession of snowdrops, cherry blossom and thousands of daffodils. People come from far and wide to see this beauty and to find peace and a welcome in the church and its surroundings. 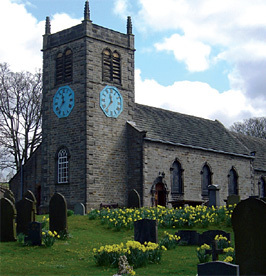 Many do no not know of the unique and fascinating history of this site, of how Christianity has played its part here from the earliest years, and of how this has interacted with the development of the village of Addingham and the surrounding area. St Peter’s is the site of an Anglian-age cross. Other crosses may be seen in parish churches at Ilkley, Otley and Leeds. Archaeological digs here have shown that Saxon burials in St Peter’s grounds were more extensive than we had previously realised. The knowledge of this rich heritage encouraged us in our plans for Christian Timeline for Addingham.